TORONTO, June 20, 2016 — As WWF-Canada releases seven new watershed reports today in a first-ever national health assessment of Canada's 25 major freshwater ecosystems, a disturbing picture is emerging: Essential data is lacking at the national level, and is either unavailable or inaccessible at the local level, as well. 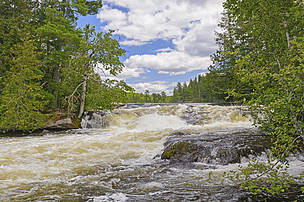 These latest reports put the assessment at the 75 per cent mark of Canada’s watersheds studied. And for 62 per cent of those watersheds, too little data is available to determine water quality and overall health. Of the seven newest reports – Pacific Coastal, Okanagan-Similkameen, Columbia, Assiniboine-Red, Winnipeg, Northern Ontario and Keewatin-Southern Baffin Island – sufficient overall water health data was available in only two, Okanagan-Similkameen and Columbia watersheds. Read the full watershed reports here. These new watershed reports were funded by HSBC Bank Canada as part of its global 150th anniversary community fund. Economists and politicians are deeply concerned about the future of freshwater, with water scarcity expected to be exacerbated by climate change, growing populations and expanding cities. From spikes in food prices to increased migration and violence after droughts and floods, water security has become an international concern. Canada is home to 20 per cent of the world’s freshwater supply, which is increasingly in demand as aquifers dry up both here and south of the border. Canadians recognize freshwater is Canada’s most important natural resource, as shown in a recent 2016 RBC Canadian Water Attitudes study, but many won’t know that we don’t have enough available or accessible information to understand existing and growing threats to freshwater ecosystems. And without that information, we can’t make smart and effective decisions about these freshwater resources that provide invaluable wealth across the country. 78 sub-watersheds out of 125 assessed are data deficient for water quality, which means overall health can’t be determined. Of all the indicators, data is particularly lacking for water quality and benthic invertebrates (bugs). While nine of the 19 watersheds already assessed score “fair” or lower, none of the watersheds have “good” water quality. The other 10 watersheds assessed to date are data deficient for water quality. We’re seeing toxic algae blooms in our lakes and tainted aquifers in our communities. Pollution is one of the most significant threats to Canada’s rivers, with most watersheds scoring as having “high” or “very high” levels of pollution. The threat is highest in Okanagan-Similkameen, Columbia, Assiniboine-Red, North Saskatchewan, South Saskatchewan, Great Lakes, Ottawa, St. Lawrence, Maritime Coastal and Saint John–St. Croix. In many parts of the country, rivers are running lower; in Alberta, river volume has been reduced by more than half. Glaciers, our great Canadian freshwater storehouses, are receding at an unprecedented rate. Extreme water events – floods in Toronto and Calgary, droughts in B.C. – are becoming more common. The normal water cycles that people count on are becoming disrupted. This unpredictability threatens food production, jeopardizes communities and costs us millions of dollars. “Canada’s commitment to freshwater stewardship, conservation and science-based decision-making is now a national priority. But we can’t act unless we first know what the problems are, and how they’re being made worse. Where it is unavailable, monitoring needs to occur. Where information is being collected at the local level, by industry and local organizations, it should be shared with governments and local organizations as accessibility and transparency are key for understanding the health of freshwater at the local and national level. Starting in 2011, WWF-Canada worked to develop an assessment framework that could be used to consistently assess the health of Canada’s 25 major watersheds and the threats they face. The methodologies were developed in consultation with a number of Canada’s leading freshwater scientists from academia, government and the not-for-profit sectors. Health indicators: Water flow, water quality, benthic invertebrates (bugs), fish. Threat indicators: Pollution, climate change, habitat loss, habitat fragmentation, overuse of water, alteration of water flows, invasive species. To date, WWF-Canada has assessed 75 per cent of Canada’s watersheds. A complete picture will be ready by 2017. Watershed Reports already completed include: Yukon, Maritime Coastal, Fraser-Lower Mainland, Great Lakes, Lower Mackenzie, North Saskatchewan, North Shore- Gaspe, Ottawa, Peace- Athabasca, Saint John- St. Croix, South Saskatchewan, St. Lawrence, Pacific Coastal, Okanagan, Columbia, Assiniboine-Red, Winnipeg, Northern Ontario and Keewatin. The watershed reports were funded by the Government of Canada, National Conservation Plan (St John- St. Croix and Maritime Coastal), the Walter and Duncan Gordon Foundation (Yukon) and HSBC Bank Canada. WWF-Canada creates solutions to the environmental challenges that matter most for Canadians. We work in places that are unique and ecologically important, so that nature, wildlife and people thrive together. Because we are all wildlife. For more info, visit wwf.ca.